We love a good trailer here at Van Clan, and you must do too if you’ve clicked onto this article! So far we’ve shown you small travel trailers, pop up campers and even a towable tiny house, but now it’s time for a luxury trailer! Trailers are often thought of as the more budget-friendly version of the motorhome world, but not this one. This luxury trailer is a stunning piece of open plan design and is probably more chic than your house. 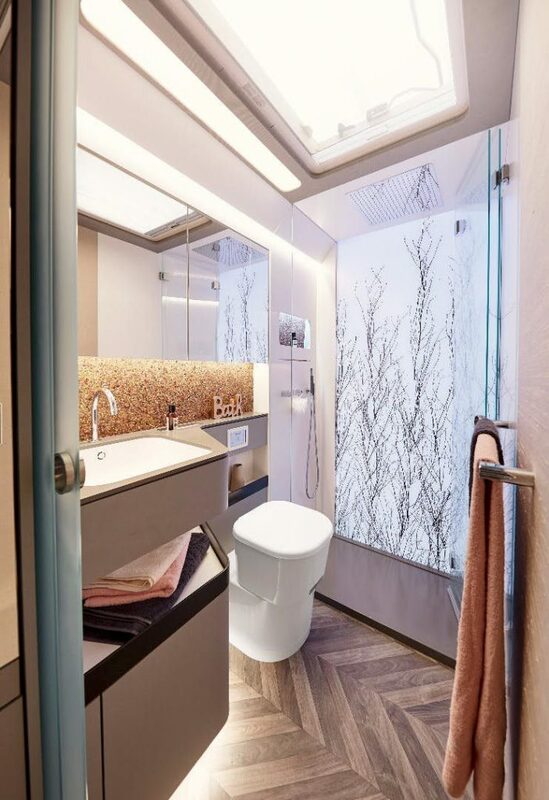 A trip away in this luxury trailer would feel like an experience saved for royalty, and you’d return feeling refreshed and pampered- not longing for a proper shower and your own bed like a weeks trip to Alicante. 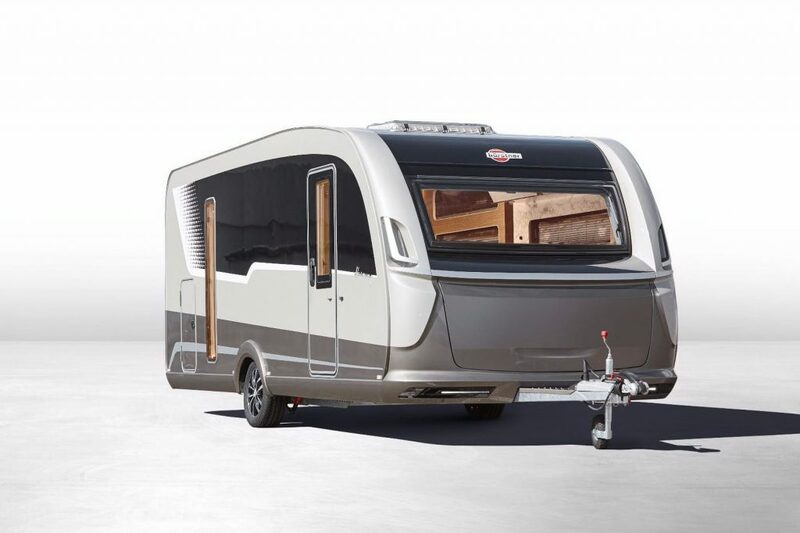 Check Out This Luxury Trailer From Bürstner! The Harmony 3 luxury trailer is still in the concept stages and is being made by the German company, Bürstner. It looks nice enough from the outside with its large picture frame windows, but it’s a bit ordinary if we’re being honest. There telltale tale signs of what is to come as soon as you step inside, which only makes it more exciting! Once you enter this luxury camper, you will be amazed. Have you just walked into a camper, or is this an expensive hotel suite? It’s not hard to notice just how much more spacious this luxury trailer has compared to your bog-standard travel trailer. This is not, however, because it is significantly larger, but because there is no separate bedroom making the living area feel cramped. No separate bedroom, I hear you wonder; that doesn’t sound very luxurious, that sounds more like a tiny trailer. But you’d be wrong. Tell Us More About This Luxury Trailer! The Harmony 3 doesn’t feature your standard fold out or rock and roll bed; it has a floating bed, suspended from the ceiling. How cool is that?! This floating bed design gives you more space in the living area and also a larger bed. This luxury trailer features a full queen sized bed, a recipe for the perfect nights sleep (and the way to my heart!) When not in use, you just simply make your bed (no need to pack away all your bedding here! ), push the bed back into the ceiling and revel in the abundance of space made available to you. Now you can do yoga on the go and not worry about banging your head! Can I Cook In This Trailer? The design of the Harmony 3 is so sleek, but the kitchen is also functional, featuring everything you could possibly desire for a comfortable trip away- and more! You won’t need to cram your pots and pans into this giant sink, in fact, it even makes washing up seem like an appealing option, especially as there is a wide window to watch the scenery outside while you’re scrubbing last nights dishes. Against the side wall of the luxury trailer is a removable dining table, and a bench seat with enough space to spread out and enjoy a romantic meal for two. 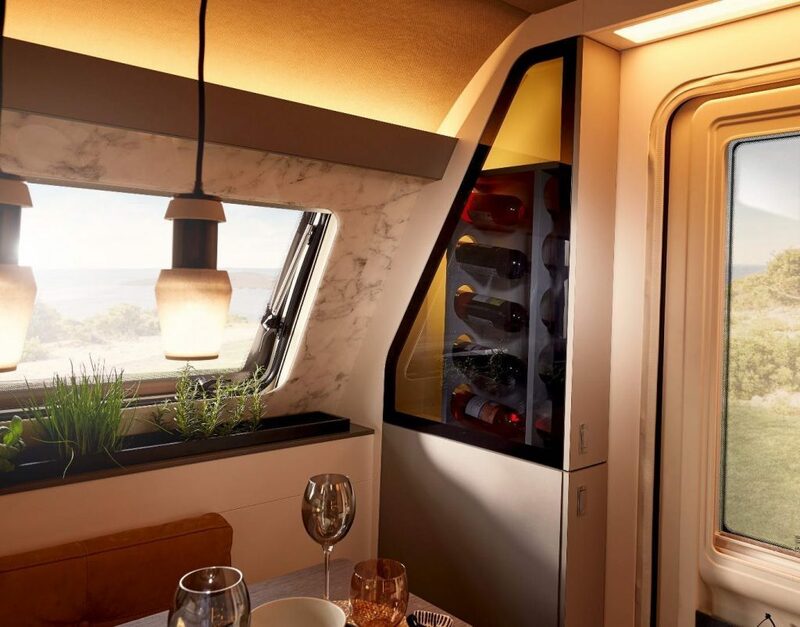 You won’t even need to get up from your meal to grab another bottle of wine as this luxury trailer features a wine rack, right next to the dining table. What more could you ask for? 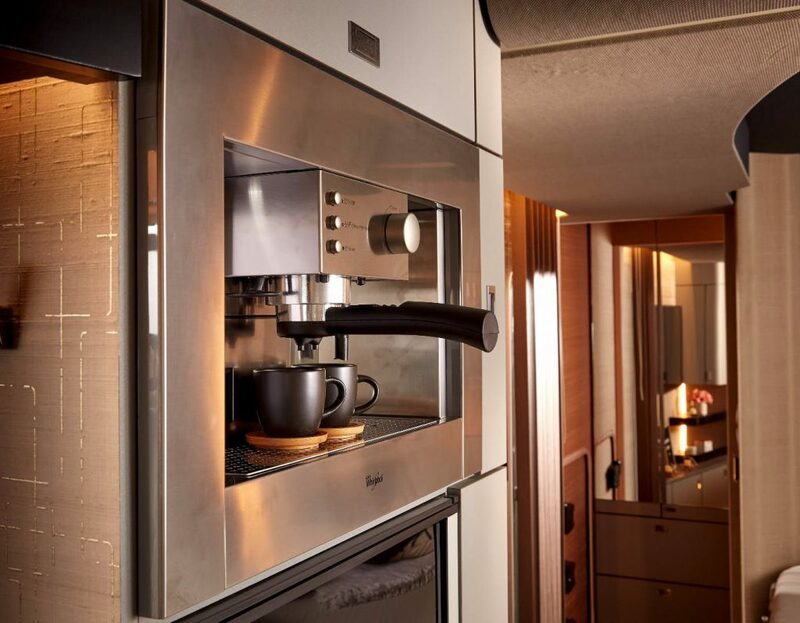 Well… how about an espresso in the morning from the kitchen’s built in espresso machine? This luxury camper’s kitchen also features an induction cooktop, gorgeous faux-stone feature walls, hanging lamps, a large skylight and its own mini herb garden. Quick… pass me the keys! Swoop round from the kitchen and enter the effortlessly stylish living area. 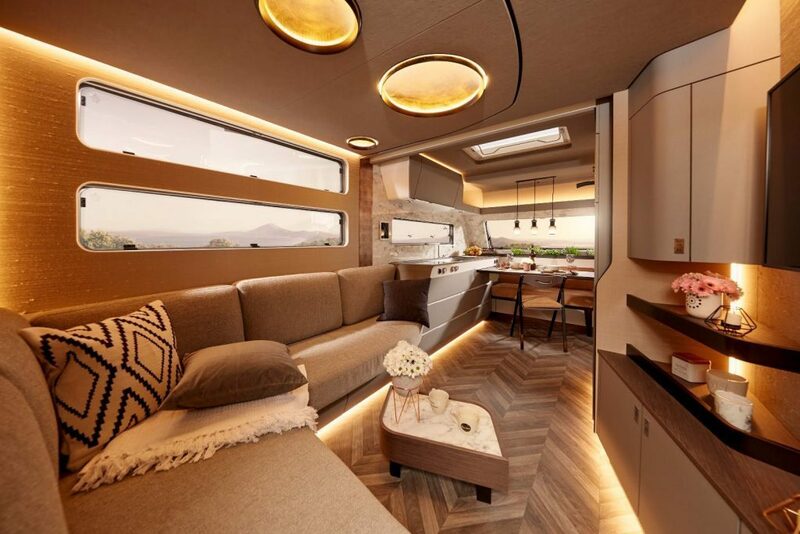 The living room of this luxury camper features an enormous corner sofa which would be big enough for two people to lie down on and still be comfortable! (we’re talking about sleep; this is a family magazine after all!). This luxury trailer even features a coffee table; after all, you’re going to need somewhere to place your espresso whilst lounging on the sofa. The living room seems to glisten with its golden walls, complemented by the golden lights on the ceiling- you can’t get much more luxurious than that folks! Storage comes in the form of a delicate looking cupboard and shelving unit, a splash of stylish practicality in an otherwise, almost outrageously, luxurious designed camper. There’s also a slimline television; you’ll never have to step outside! The Harmony 3 makes the most of natural light with its large windows and skylight, but soft LED’s can be turned on when the night draws in. Elegant hanging lamps and golden lampshades mounted to the ceiling make you feel like you’re in some sort of palace, and you’ll also find lighting skimming the base of the sofa and the all of the units too, as well as shining out from behind the shelves. Glowing furniture; know I know how Kanye West must feel when he comes home every day. Undoubtedly the most significant luxury is having a bathroom, and the Harmony 3 won’t disappoint. This washroom would not look out of place in a 5-star hotel or a millionaires mansion! Flooded with natural light through the skylight that takes up almost the entire ceiling, this bathroom seems huge, and houses a stunning glass shower unit, large sink with a cupboard below, a large mirrored cabinet above and, of course, the toilet. This luxury trailer has somehow even managed to make the portable potty look stylish! The shower unit looks incredibly inviting, boasting not one but two shower heads. There is nothing better than a good shower after a long day outdoors; heaven! This luxury trailer is absolutely gorgeous, if your looking to sleep in style, then this is the tiny home for you. 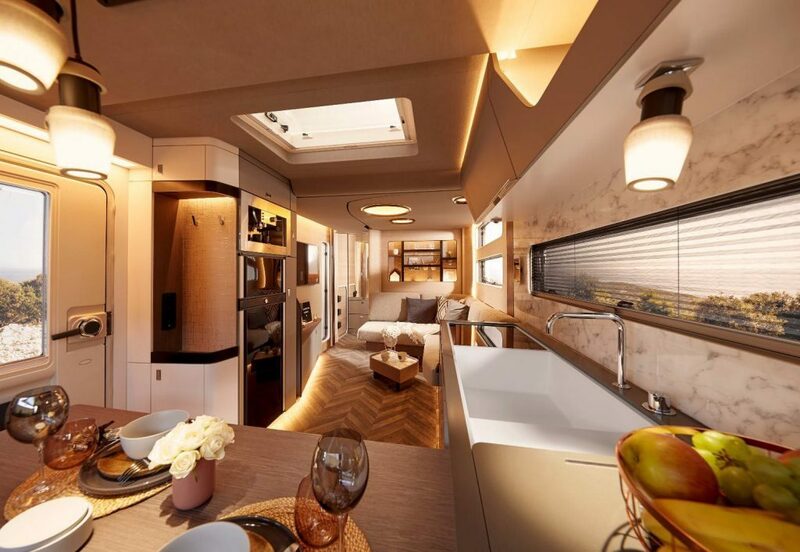 The interior of this camper is mega stylish and would definitely impress anyone who stepped inside. The Harmony 3 would be the perfect base for a romantic trip away, or even a honeymoon. As this luxury trailer is still in the concept stage, there is no price tag attached to it just yet. I imagine The Harmony 3 isn’t going to come in cheap, but it obviously has no expense spared on its interior, so this is understandable. If you want luxury, glamour and to be able to show off your chic luxury trailer, then you have to be prepared to pay the price! Check out this luxury motorhome – the perfect partner for your luxury trailer! Not bothered about luxury – this Nestbox converts your car into a camper! Do you have the need for speed? Our Top 10 Travel Bikes article might just be of interest.